Yesterday was a beautiful, warm, overcast day. The boys were ahead in their schooling, I had no pressing deadlines and Bo had no calls to run. We decided to pack a picnic and visit the zoo. My parents give us a zoo membership each year for Christmas and it is one of the best gifts! We don't visit often during the hot summer months (ok, probably not at all . . . ) but during fall, winter & spring we enjoy frequent visits. The temps are starting to cool off, so for us it's the beginning of outdoor fun. 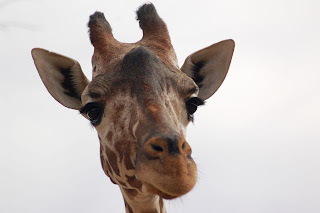 One of the nicest things about having a membership is that there is no need to visit the entire zoo during a visit. We can take our time and visit different areas each time, or visit the same animals over and over again. 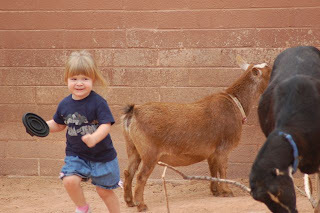 Here you can see Lydia having fun with the goats. She would walk carefully over to a goat, give them one quick brush, then dart away. 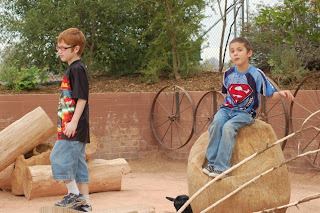 The boys have grown up visiting the zoo, and they were a bit frustrated with some of the changes being instituted. I think we're fortunate that the zoo is working on improvements, and adding new exhibits -- but the boys are at a place where they want everything to stay the same. I can understand that, as I'm in disbelief that my oldest will be 9 next week, and have fleeting moments of wishing they could all just stay as they are right now. 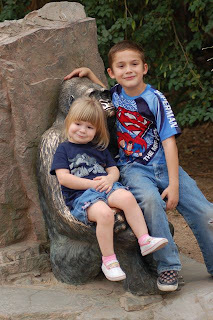 We've spent years just enjoying the zoo, but I can see that the next few years will find us studying more diligently and having more focus during our visits for the boys. They've enjoyed visiting over the years, but they're ready for deeper understanding of the animals, habitats and continents of those in our zoo. 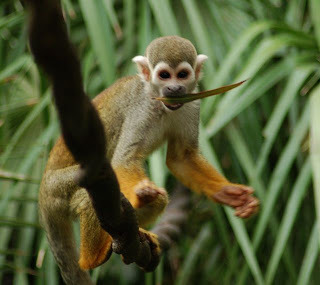 At least I still have Lydia to run, play and be in awe of the spider monkeys. Hahah, I'll still be in awe of the spider monkeys, lol.